Home / Unlabelled / Me and my homebred kohaku on the front cover of 'Koi Carp' Magazine this month! 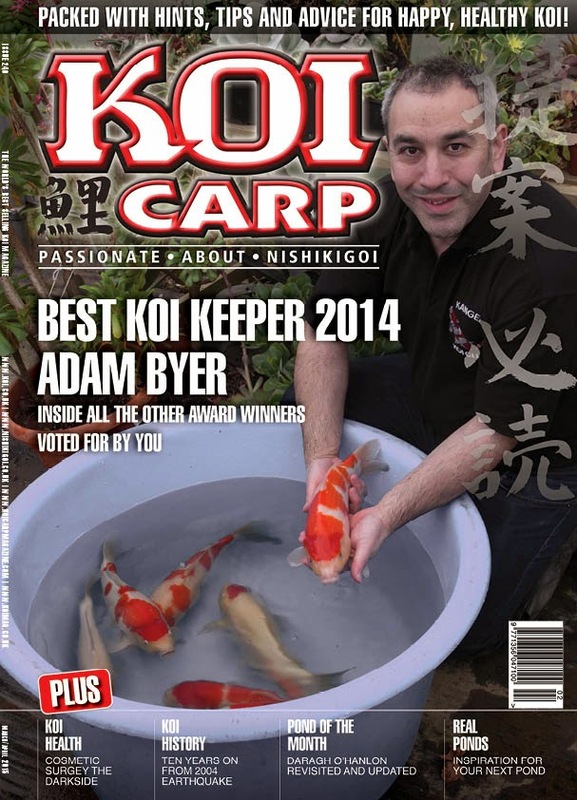 Me and my homebred kohaku on the front cover of 'Koi Carp' Magazine this month! The latest edition of Koi Carp magazine is out, and I've made it onto the front cover with a picture of me and my homebred kohaku! And a reminder of my award too - I'm so chuffed, and wanted to share the front cover with you. News my end - spawnings are not far away. The females are ready, and I'm just waiting for the temps to warm up a little bit and for the fry pond to cycle a little more; they're almost ready, but not quite. Debates about which variety to spawn are ongoing in the Byer household.